I love the Many Glacier area of Glacier Park. I stayed at the Many Glacier Hotel and really enjoyed it. Historic Lodges are so cool – the rooms and the lobby have a rustic charm that you don’t get in today’s modern hotels. No TVs and you don’t miss them. David Walburn, a talented local musician, plays nightly as part of a music tradition that dates back to the early days at the lodge. It is so nice to be able to walk out of the lodge and hit the trail for a hike or ride the historic boats on Swiftcurrent and Josephine Lakes. The Many Glacier area feels like the heart of the park – there is an abundance of spectacular scenery and wildlife in the surrounding area that can lead you as far as your energy lasts. Here is a 3-minute video overview of the Many Glacier Hotel that we filmed during our visit and posted on YouTube. I hope you enjoy it. My husband and I spent 3 days in Many Glacier Lodge. Their price is steep, but oh my God. What a perfect place. That area was our favorite part of Glacier. One day it rained and we found so much to do just in Many Glacier. My husband’s a photographer and loved the sunrises there. Perfect slice of heaven. 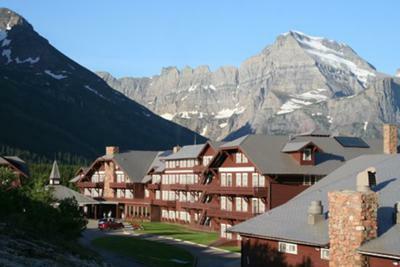 If you have the extra funds, definitely spend a night in Many Glacier. You won’t regret it. Our stay was from 9/13/09 through 9/20/09. The time we spent at Many Glacier Lodge was extraordinary, I look at our pictures almost daily. I read before we left that Glacier Park will *change you* which is an understatement It was an experience I will never forget. Our room at Many Glacier Lodge was as advertised. Because we booked as soon as reservations could be made our room was perfect, main level and lakeside It was a view with a room. For those of you that intend to hike be prepared for the most amazing scenery and terrain, much less the wildlife. The moderately low altitude helped. Many Glacier Lodge, Best place to see grizzly bears!! If you like wildlife, this is the best place to see it. Take the horseback ride and later see grizzly bears walking the same trails you just rode, only yards from Many Glacier Lodge!! Book early, as it is a favorite. With All Due Respect and Dignity – It was an Honour and a Privilege for me to have managed The MANY GLACIER HOTEL from years 1961 – 1983 – In which seasons I employed the MAJORITY OF OUR 200 Employees who not only ran the Lodge (selected believe it or not from 25,000 paper Applications each year (!) but who were MOSTLY ALL College / University Students majoring in MUSIC / THEATRE or related, or who were EXTREMELY TALENTED. We also sought out Hotel/Restaurant Majors, Accounting Majors, and Culinary Arts Majors – NATIONWIDE. 27 Broadway/London Musicals were staged in my Era there, with Orchestra – Singing Dining Room Staff – Evening Concerts and Recitals – The Many Glacier Singers – Community Sings, Thursday Serenades, Momday Night Hootenannies – and the list went on and on, and also featured THE MISSGLACIER PARK PAGEANT, each summer. Since 1983 – that GLORIOUS FEATURE OF THE HOTEL, has diminished to most extent – WHICH HAS BEEN A HORRIBLE, AWFUL MISTAKE. I H O P E – that the currect Concessioner XANTERRA will see fit to return the place to that Music Theatre GLORY of those old days – which added SO MUCH in the EVENINGS, to the ENJOYMENT of our Guests and Visitors. Ian B. Tippet – GPCo/GPInc., 1950-2013 – and at Tippet Cottage 2014.